I'm thrilled to announce Rockman Corner hit 5,000,000 page views earlier this week, a milestone that deserves a big thank you! When I first opened this place up in 2008, I wasn't sure I'd attract an audience, let alone become a viable source for news and whatnot. But here we are and I have you to thank. My little corner of the net would be nothing without you. I send my sincerest thanks to my companions at The Mega Man Network, the Capcom Unity crew, everyone at Get Me Off the Moon, UDON Entertainment, Game Informer's Tim Turi, and Destructoid's Tony Ponce. It's been an absolute pleasure working with all of you. I realize Mega Man news has been sluggish. Good Mega Man news, at least. In spite of that, you guys stuck it out with me. Together we've weathered game cancellations and much drama. Better days are yet to come, I believe. I hope that we'll embrace whatever Capcom has in store for the Blue Bomber together. 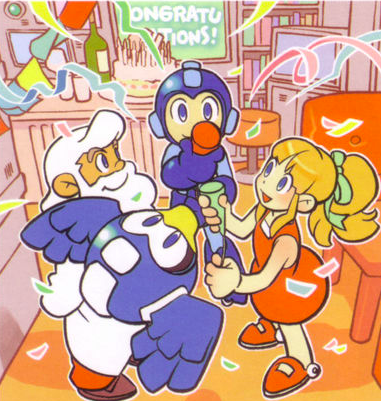 Here's to Rockman Corner reaching five million. Thanks, everyone. Congrats, Protodude. Your really are the #1 source for Mega Man news. Awesome! you rock Protodude, keep up the good work! The first time I knew about this blog was because i was searching for some info about a posible Megaman ZX3 lol back then around 2008 I guess. It'll take a lot more than slow Megaman news to make me take you off the bookmark folder I check daily. I'm really lazy. I've been following you for years now and although Megaman has been more on the quite side recently, it still hasn't kept me far from your blog. I appreciate every thing you've done from keeping us updated on the newest information of Megaman games to even the smallest unique underwear item or shoe nik nak. Your relentless efforts with Legends has shown us all your wonderful characteristics. Keep up the great work no matter what lies ahead for Megaman's future. Shoot, I remember when back when we celebrated one million hits. This blog really is great, even if the news hasn't been. Congrats, man! Congrats on so many page views. As an avid Mega Man fan, it's great to have a single source for Mega Man news. Congrats on the landmark, it's definitely well deserved! First found this blog back around the time that Ryuusei no Rockman 3's info was still coming in. If I'm not mistaken that was back in '08. Wow, I had no idea I found the blog while it was still new. The earliest article I remember is the one when you first announced the Megaman 9 secret, you know the one that's never been solved. And even THEN I'm sure I've been around earlier, and I still stop by daily. Happy 5 mil protodude, Let's hope for another few million! Thanks for keeping us posted, Protodude. It must be hard waiting for the next big (good) news. But rest assured, you aren't alone haha. ...and make sure those kids continue to immerse themselves in the adventures of the blue bomber! Your awesome man, I check your blog every morning and after school. You always find some news for us everyday no matter how big or small. Congratulations! I love all the Megaman news you post!